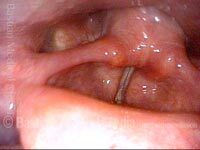 An infection or inflammation of the larynx. The cause of laryngitis can be viral, bacterial, or fungal (candida). Or it can result from acid reflux, cancer radiation therapy, surgery (as temporary post-operative inflammation), or an auto-immune disorder. See also: candida laryngitis, ulcerative laryngitis, laryngitis sicca, and laryngopharynx acid reflux disease (LPRD). Severe laryngeal candidiasis, in a person using inhaled steroids at high dose. Standard light. Closer view shows more clearly not only the white areas, but also surrounding inflammation. Standard light. After 15 days of oral fluconazole. Obvious improvement, but incomplete resolution of tissue changes. After longer-term fluconazole, along with reduction of inhaled steroid dose, complete resolution. Strobe light, closed phase of vibration at high vocal pitch. Candidiasis in patient using inhaled steroids for asthma. Under standard light, the lesions are vague, hazy, and best seen anteriorly on the right cord (left of image). Same patient, narrow-band illumination. This not only emphasizes vascularity, but brings out the candida colonies. After treatment with fluconazole, the colonies have virtually disappeared. Same post-treatment examination, under narrow-band illumination. Note that there are normal specks of mucus (such as at the arrows) in the view. Elderly woman with a history of laryngeal amyloidosis requiring laser sculpting several years earlier. Now using high-dose inhaled steroids, antibiotics, and oral steroids for unrelated pulmonary problem. 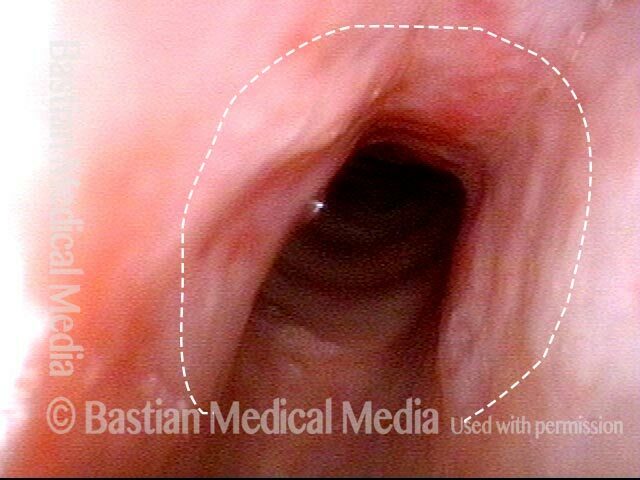 Marked increase of hoarseness, and whitish discoloration, especially of the left vocal cord (right of image). Closer view of hazy white areas and irregular right cord margin (left of image), presumed to be candida overgrowth. Empiric treatment with fluconazole is justified, given history and findings. Two weeks after starting fluconazole; the white areas are completely resolved. The patient’s voice had improved markedly within three or four days of starting the treatment. Ulcerated area, free margin of both vocal cords. When diagnosed at this early stage, the patient is notified that recovery will likely require as much as six weeks. 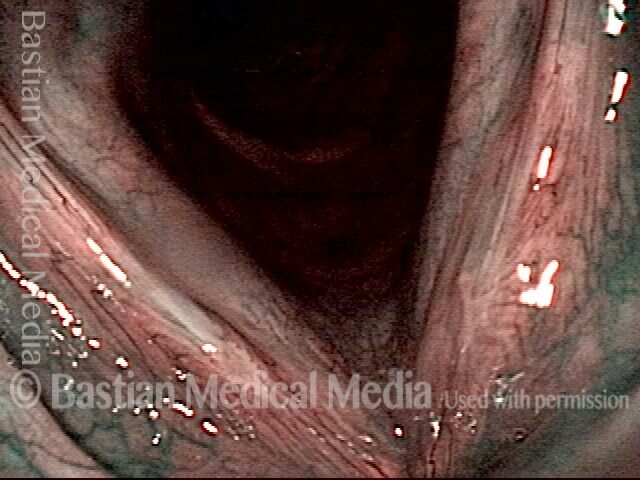 Same view, but using narrow band illumination to accentuate the ulcers. One month later, under narrow band illumination. Ulceration dramatically diminished. At three months, standard illumination. Virtually complete healing, with excellent return of voice. The prominent vascularity at area of ulcer will eventually fade. 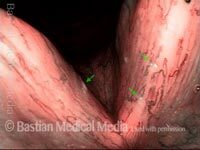 In a patient who had had hoarseness lasting several months, this inflammatory lesion of the right vocal cord (left of image) was identified. There is hazy leukoplakia surrounding a central intensely erythematous ulcer. 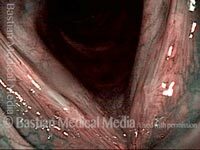 It most resembles an aphthous ulcer, though these are not previously reported on the vocal cord, and this lesion's duration is longer than the typical aphthous ulcer. Closer view, under narrow-band light. The vessel pattern looks inflammatory and not neoplastic. There is heaped-up leukoplakia surrounding the lesion. After this lesion persisted for more than four months, it was removed. Tissue examination showed inflammatory response and keratosis without atypia. 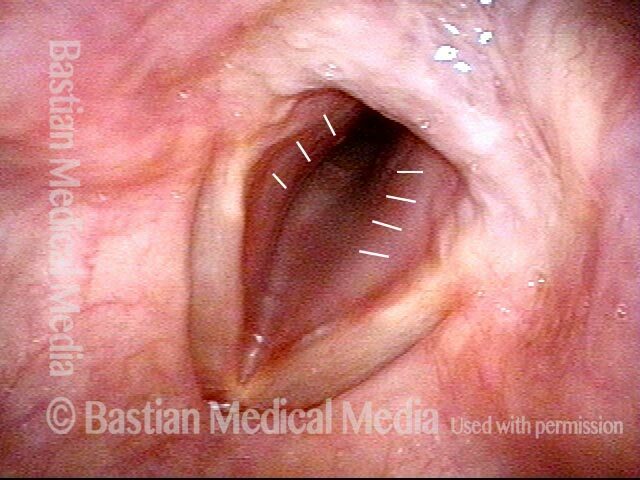 Standard light view almost into the subglottis, showing that the yellow mucus crusts here are adherent primarily to the immediate under-surface of the cords, just below their free margins. Pachyderma, here referring to the heaped up mucosa in the interarytenoid area, in a patient with laryngitis sicca. Adducted (voicing) position. Note that the pachyderma does not interfere with closure of the cords. In this case, the pachyderma does not directly affect the patient’s voice, which is typical, but the more generalized inflammatory condition (see the redness of the cords) does. Narrow-band lighting. This shows some stippled vascular markings, often seen with chronic inflammation or HPV infection. 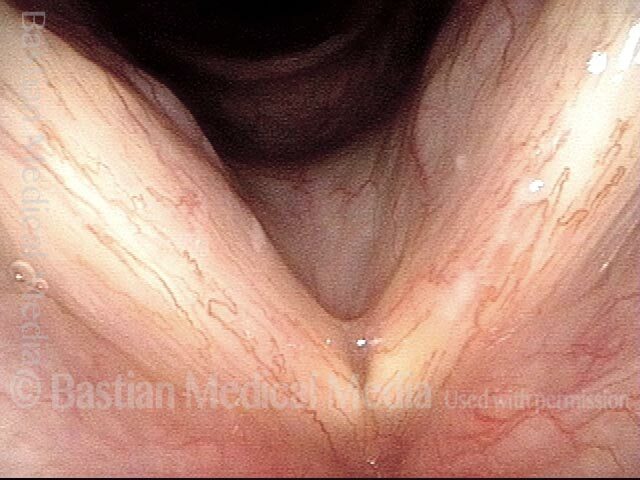 Open phase of vibration, strobe light, with white mucus sometimes but not always suggestive of acid reflux laryngitis. Closed phase of vibration, strobe light, with same mucus findings. Panoramic view, shows interarytenoid pachyderma (“elephant skin”) at upper blue arrow; arytenoid redness at green arrows; and mucus retention cyst at lower blue arrow. 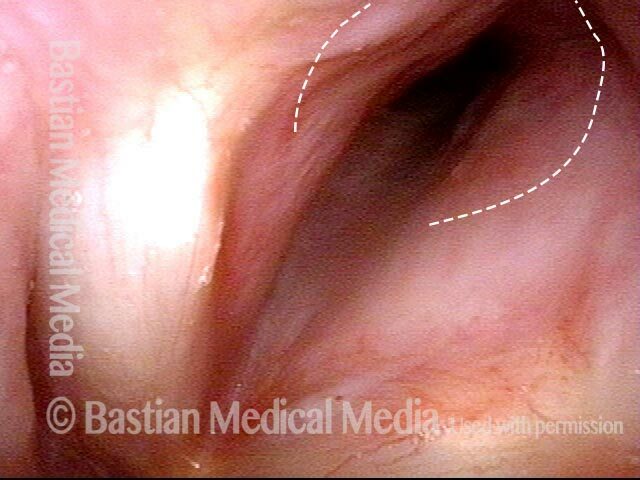 During phonation, interarytenoid pachyderma and mucus retention cyst are typically obscured. Phonation under strobe light. Mild capillary prominence. As phonation proceeds, appearance of large amounts of viscous white mucus. This entry was posted in Multimedia Encyclopedia and tagged Photos by admin. Bookmark the permalink.